Factor investing focuses on identifying and investing in certain styles or themes. Here is how to use it to your advantage. Try this investing strategy on for size. Factor investing (also called "Smart Beta") focuses on identifying and investing in certain styles or themes. According to Morningstar, these strategies (dubbed "Strategic Beta" by the firm) seek to enhance returns by using transparent and rules-based approaches to target specific investment attributes (like value, growth, quality, low volatility, and momentum). Factor-based strategies tend to charge fees that are higher than a traditional index or exchange-traded funds (ETFs), though they are generally less expensive than traditional actively managed investments. While actively managed strategies as a whole have struggled to retain assets post-financial crisis, index funds and ETFs have raked in assets. 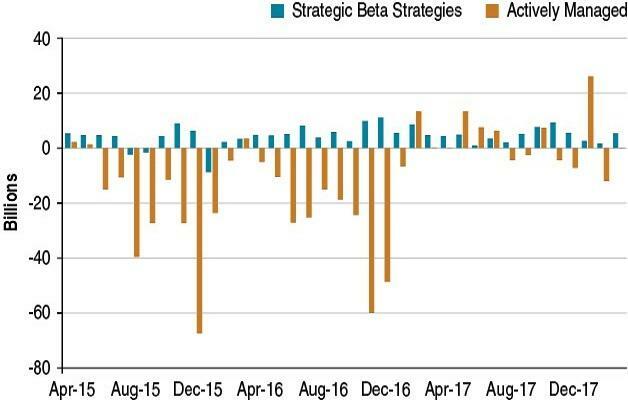 The chart below shows fund flows for ETFs utilizing factor-based strategies versus all actively managed strategies over the trailing three years. The factor-based funds experienced only a handful of months of negative flows compared to nearly two-thirds of the months for actively managed strategies. A plethora of factor strategies have cropped up in the last few years and investors must take care when considering these investment options. Academia has largely agreed on a handful of factors that have been proven to outperform over the long term-value, growth, size (small), quality, low volatility, and momentum-but how asset management firms package these factors into investable securities can vary widely. Investors must proceed with caution. The value factor is one of the most well-known and has widespread academic support. Value measures the comparative "cheapness" of a stock using any number of data points. These strategies typically rank the universe of stocks by "cheapness" and purchase the least expensive names. This strategy is likely to suffer in broad-based selloffs as those undervalued companies often have characteristics that investors deem riskier and are more eager to sell. Alternatively, the growth factor focuses on firms with high historical and future earnings and revenue growth. Strategies can be as simple as ranking the universe by "growthiness" and buying those with the highest growth characteristics. These strategies can prove to be high-flying in strong equity markets, as was the case in 2017, but may suddenly drop off should the economic picture become less robust. Momentum is a strategy that relies on buying past winners and selling past losers. The strategy can be as simple as purchasing stocks with the highest price return over a specified period of time with regular rebalancing. The theory behind this is that markets tend to keep moving in the same direction (either up or down) until they don't, and the trend reverses. This strategy is likely to perform poorly in fast-moving markets as sudden drop offs or snap backs are difficult for this strategy to either avoid or participate in. The quality factor refers to the quality of the underlying business and typically favors firms with low leverage and high returns on equity. Because the definition of quality differs among firms there can be high variability among investments following this strategy. This factor tilt may allow a fund to do better during a market decline because, theoretically, higher-quality companies should be favored by investors in times of stress. The low volatility factor is, at its simplest, one that buys stocks that have experienced the lowest volatility over a specified time period, rebalancing regularly. Implementation of this factor can vary widely among index providers so it's important for investors to understand how this universe is segmented. Finally, asset management firms have begun to launch multi-factor investment strategies that seek to combine a number of these aforementioned elements into one product. Some managers will tactically allocate to factors as they go in and out of favor, others will balance the factors more statically over time in an effort to maintain some level of diversification. Though historical data can be limited on individual strategies, Standard & Poor's has numerous factor indexes, some with long histories. Below, return and risk metrics for the five factors discussed above plus the broad-based S&P 500 Index are shown. As always, past performance is not indicative of future results. Each factor has performed alternatively well and poorly in different market environments. A prolonged period of underperformance for value and an alternatively strong environment for growth led those two factor indices to land behind and ahead of the broader S&P 500 Index over multiple trailing periods though March 2018. The low volatility factor has tended to hold up better in periods of stress, though that is not an absolute. It was down more than the broader index during the first quarter of 2018 as that index can be dominated by so-called bond proxies (utilities, for example), which saw steep declines along with the stock market in late January, providing little of the diversification benefit historically afforded to that strategy. Know your factors. Each fund provider can define their factors differently, which leads to dispersion in return patterns even among the same factor-based investment options. Isolating a single factor will likely generate higher volatility. Factors tend to fall in and out of favor, sometimes for long periods of time. Adding a factor tilt to a portfolio may over expose investors to that factor depending on the inherent leanings of the other portfolio holdings. In all, factor ETFs are no different than any other investment option-though many times they have lower fees. At the end of the day, investors need to fully understand what goes on "under the hood" and have realistic expectations about performance in various market conditions before purchasing a factor-based investment strategy. Cara Esser, CFA is a senior investment research analyst and investment committee member in Mesirow Financial's Retirement Planning and Advisory group.